You Are Listening To "Seven Spanish Angels"
Step back in time over three million years and follow the trail of the majestic petrified Redwood giants. Because of their protected status, most trees are viewed from behind fences or from overlooks. 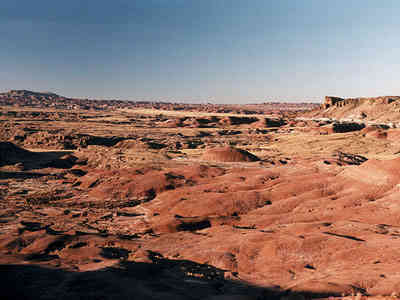 The Petrified Forest National Park encompasses 93,533 acres full of scenic wonders. The park is in northeast Arizona. A 27-mile scenic drive runs through the length of the park. Hard to realize this was a living tree at one time. 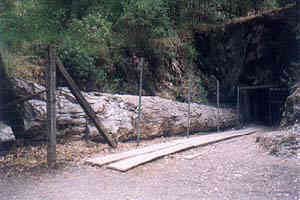 The first petrified tree exposed is called the Pit tree because it lies in a 15 foot deep pit. It is the only pine tree preserved in the park. It is 43 feel long and 2 feet in diameter. 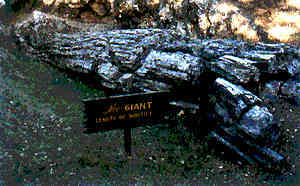 The Giant is the next tree we see. It is a handsome specimen of a redwood. 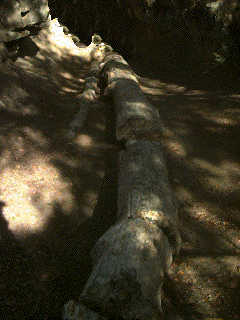 It is 60 feet long and 6 feet in diameter. 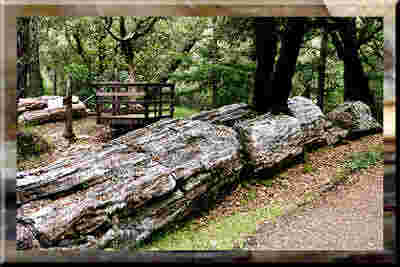 At 105 feet long and 6 feet in diameter, The Monarch, or "tunnel tree" is the largest intact petrified tree in the world. 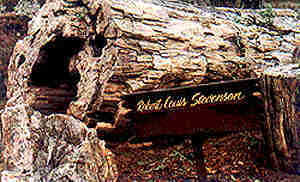 The "Robert Louis Stevenson" tree has the best display of growth rings and surface detail. 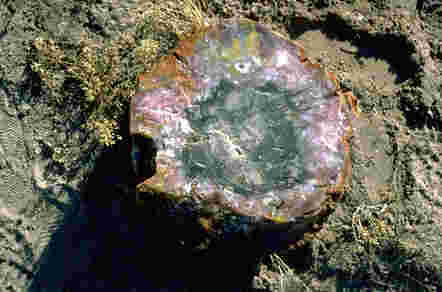 Druzy quartz also adorns the surface. The tree is 5 feet in diameter. Our next stop is equally awesome. 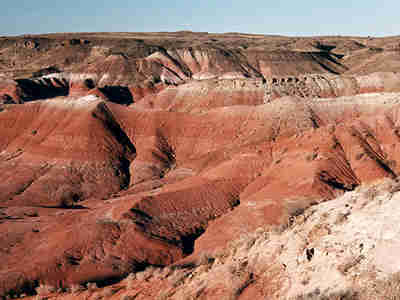 Also within the park are the many-colored hues of the Painted Desert. 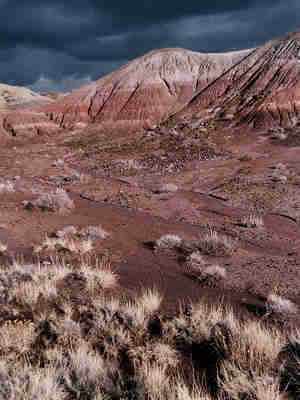 The scenery in the Painted Desert badlands is dramatic and beautiful. The eroded layers of ancient lake beds exposed in sculptured form gives the area an "other worldly" feel. The rich colors are enhanced by the changing light of the day. We're off to the northwest. Everyone hang onto your hats because you are about to see the biggest old "hole in the ground" you've ever seen. 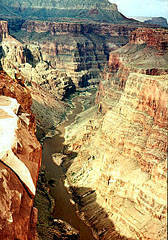 The Grand Canyon National Park is located entirely in northern Arizona. It is up to a mile deep, anywhere from four to eighteen miles wide and two-hundred miles long. Plateaus on the north and south rise 5000 to 9000 feet above sea level partly as the result of tectonic forces which lifted the north rim more than 1000 feet higher than the south rim in some places. 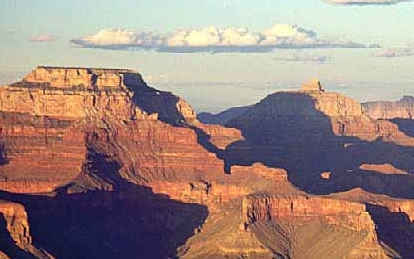 This is a photographer's paradise although no camera can capture the awesome beauty of the Grand Canyon. Let's just stroll along the south rim and take it all in. Now, wouldn't you say that's a bit more than "just a hole in the ground?" There's a little more of Arizona we'd like to show you. You know the routine. Click on the Arizona flag.